UNITED NATIONS (CNN) -- Israel won't accept "one word" of a U.N. report blaming it for deaths and more than $10 million in damage to U.N. buildings during its monthlong offensive in Gaza, its president said Wednesday. 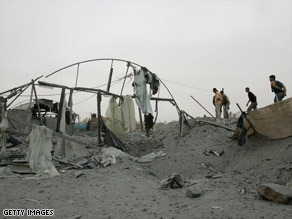 Israel Defense Minister Ehud Barak disputed allegations that the government caused civilian deaths in Gaza. A U.N. board of inquiry blamed Israel for the damage during its December-January military offensive against the Palestinian territory's Hamas rulers. Israeli President Shimon Peres said his country's military had made "mistakes," but said the offensive was aimed at stopping the firing of rockets into Israeli towns from Gaza. "We're outraged because they didn't mention Hamas," he told reporters at U.N. headquarters in New York. "If Hamas wouldn't shoot, there wouldn't be a single problem." Peres, whose office is largely ceremonial, raised his objections in a meeting with U.N. Secretary-General Ban Ki-moon. "We don't accept one word of what the board wrote," he said. Israeli bombardments struck three U.N. schools and set ablaze the world body's main aid distribution warehouse in the territory during the three-week offensive. The U.N. committee recommended the Israeli government repay the United Nations for damage to its buildings during the fight in Gaza and take better precautions to ensure that U.N. staffers and other civilians are not killed. "The board found that the government of Israel is responsible for the deaths and injuries that occurred within the United Nations premises and the physical damage that was done to United Nations premises," the report stated. "The board found that the United Nations Relief Works Agency sustained losses and damage to property with a total estimated repair and replacement cost of over $10.4 million." In April, Israeli officials said the military had conducted its own investigation of the fighting and concluded that its forces did not break international law. Peres called the U.N. findings one-sided and unfair. "We don't think we need to apologize, because we have the right to defend the lives of our children and women," he said. He added, "If Hamas wouldn't fire, there wouldn't be a single cartridge filed from Israel." The United Nations found that at least 1,300 Palestinians were killed in the December 27-January 19 conflict, but other estimates vary by a matter of hundreds. The Israel Defense Forces said 1,166 Palestinians had been killed and 709 of them were "terror operatives" from Hamas and other groups. The Palestinian Center for Human Rights published a study that put the total death toll from the operation at 1,417, including 926 civilians. It said 313 of the dead were children under the age of 18, and 116 were women, while 255 "non-combatant" police officers and 236 who took "an active part in hostilities" also died. Israel reported 10 soldiers and three civilians killed. But Defense Minister Ehud Barak said the U.N. report ignored "4,000 rockets and mortar shells that hit on the heads of our civilian population for eight years before Israel went there."